In 2006, the Partnership for the Delaware Estuary (PDE) identified coastal wetlands status and trends as a top priority for understanding the overall environmental health of the watershed. Until then, information about coastal wetland condition and acreage was limited and not consistent among the three states. In 2007, PDE worked with the Delaware Department of Natural Resources and Environmental Control (DNREC) to design and begin to implement a multi-level program to assess the health and extent of coastal wetlands in a consistent manner across the Delaware Estuary. Then, in 2008, PDE along with the Barnegat Bay Partnership (BBP) expanded this program to areas outside the Delaware Estuary, referring to it as the Mid Atlantic Coastal Wetland Assessment (MACWA). MACWA supports a comprehensive assessment of coastal wetland condition across the Mid Atlantic region. PDE, BBP, and partners such as the Academy of Natural Science of Drexel University have since worked to implement MACWA as a regional strategy, which is continuously updated and strengthened. The Mid Atlantic Coastal Wetlands Assessment program would not be possible without the generous funding and support provided by multiple entities, including US EPA Region 2 and the US EPA Head Quarters. This tier involves work at the largest scale: the landscape. Using remote sensing, landscape level changes, inventories, and land or habitat classifications can be performed. GIS is the primary tool used to investigate these large-scale changes. Landscape data and models, which are based on the analysis of satellite imagery, have revealed that there is an alarming loss and degradation of tidal marshes in the Mid Atlantic. Habitat and biotics: the composition of the plants and animals within a wetland provide insight on the health and function that the wetland potentially provides. Variables assessed include plant community structure (type and abundance of plant species), proxies for above and below ground biomass, and the presence of invasive plants. Hydrology: since tidal flushing is an important part of the processes that sustain coastal wetlands, changes to the natural flow of water, such as ditching or filling, can be detrimental to wetland viability. Buffers: human activities in adjacent uplands can have direct impacts on wetland function due to run off. Therefore land uses are categorized as part of the MidTRAM protocol; historical disturbance and other alterations within a specified buffer space are also inventoried. Shorelines: dynamics at the water-wetland interface can lead to erosion or accretion (building) of sediment; locations with excessive erosion often lead to net wetland losses, so conditions and rates of change along the shoreline are quantified as part of the MidTRAM. 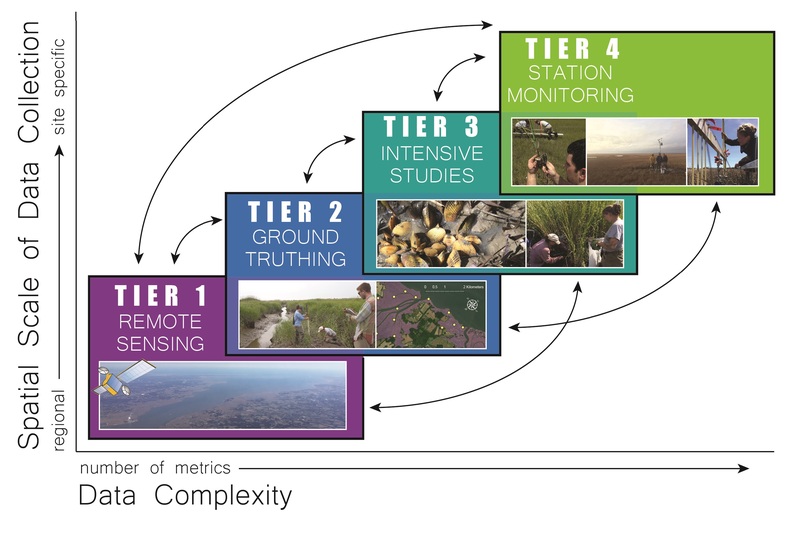 Tier 3, or Intensive Studies, are discrete projects that address research questions related to wetland condition, function, ecosystem services, and/or restoration. Examples of intensive studies range from understanding the threat of climate changes and sea level rise by studying carbon content in sediments to engaging citizen scientists to collect shoreline change data. Below are some examples of Tier 3 studies carried out by various MACWA partners. Blue Carbon: This is the term used for carbon that is stored in coastal systems such a salt marshes, mangroves, and SAV beds. Blue carbon studies have become increasingly important to better understand how we can reduce carbon in our atmosphere. Living shorelines and other wetland restoration projects can be created to not only stabilize shorelines and provide habitat to wildlife, but also to sequester carbon. This intensive study is assessing the carbon storage capacity of living shorelines. Sediment cores from living shorelines of various ages are examined to investigate carbon storage potentials. This project is intended to provide insight in the carbon stock of living shorelines. Shellfish Services: This intensive study targets the spatial and temporal contribution of ribbed mussels to water quality in salt marshes. Ribbed mussels are filter feeders that can remove large quantities of nutrients and suspended sediments from the water column, where abundant, and are therefore vital to the health of wetland ecosystems. Paddle for the Edge: This program was launched in 2015 to gather shoreline data in Barnegat Bay. These data collection efforts are driven by volunteer kayakers, canoeists, and stand-up paddle boarders. Citizen scientists are trained to use their smart phones to survey shorelines, covering a range of processes such as recreational use, shellfish growth, water quality, erosion/accretion, built structures, and plant and animal composition. These data will be used by scientists and planners to better predict flooding and storm impacts, identify potential restoration areas, and evaluate the recreational, habitat, and commercial value of coastal wetlands. Marsh Futures: This is a tool designed to provide local site planning support and guidance for investments in salt marsh protection and enhancement. The Marsh Futures approach uses remote sensing data, GIS, and on the ground scientific surveys of physical and biological conditions to provide guidance to coastal communities and environmental managers on marsh vulnerability. This tool will provide valuable information regarding the status of coastal wetlands and appropriate interventions, if needed. The main focus of Site Specific Intensive Monitoring (SSIM; Tier 4) is to track changes I physical, chemical, and biological conditions. The goal is to relate any changes to sea level rise and other stressors. Having a network of SSIM stations facilitates spatial analyses in addition to temporal analyses. The SSIM program consists of a suite of data collection which incorporate permanent vegetation plots, elevation surveys, water quality, and soil quality metrics.